Not a bad spot to hit up on St. Patrick's Day. 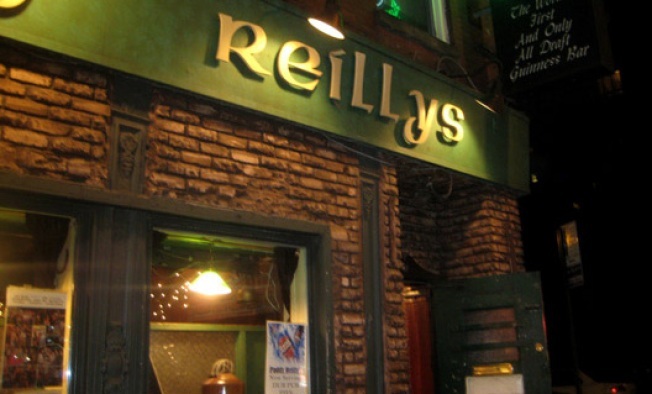 Murray Hill’s Paddy Reilly’s, on 2nd and 29th, knows what it likes, and that’s Guinness. “The World’s First and the Only All Draft Guinness Bar,” is how, with tortured syntax, the pub proudly bills itself. Inside, all seven of the tap pulls are given over the inky brew. If you want Harp or Smithwick or Bud, you’ll have to settle for a bottle, friend. Everyone here seems to walk around with a Guinness in one hand and a guitar in the other. Because aside from stout, Paddy Reilly’s is known for music; it was apparently once owned by Irish folk singer Patrick “Paddy” Reilly. Wednesday night is open-mike night, when every barfly listening to the troubadour on the small stage in the back is probably also a musician. A bespectacled woman singing a squishy song “about letting someone into your life” elicited little reaction from the crowd—aside from Jimmy, who, that night, functioned as Paddy Reilly’s redneck, backward-baseball-cap version of “Cheers”’ Norm, offering an off-color hoot and holler on almost any subject. “Hot knishes, cold soda!” he bellowed, apropos of nothing. Wayne, a hirsute young showboater with a Mike Nesmith wool cap, had better luck, bringing down the house with a hilariously profane ditty about Jesus’ womanizing, ne’er-do-well bother, Craig Christ. “B---f--- me Jesus!” screamed Jimmy with joy. Ian, a regular, was next, strumming sincerely about bouts of existential and romantic distress. Wayne and his pals visited the bathrooms, labeled “Hen House” and “Tool Shed,” and left. And then Jimmy himself took the stage and brought the whole room down. He sang, with irreverent gusto and unvarnished candor, a song so offensive that I can’t reprint a single line here. The unsmiling female bartender—in whose mouth butter would not melt and in whose bouncer skills I have no doubt—was having none of it. She shot Jimmy a look that would sober up a frat boy at Mardi Gras. Open mike night was over. Time for another Guinness.